The latest murder case for amateur detectives Ann Lee and Fang Chen takes them on an intercontinental investigation in this thriller. 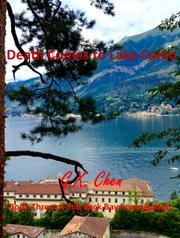 Ann’s gumshoe partner/best friend, Fang Chen, and ex-roommate Jane Tian are newlyweds honeymooning at an Italian hotel facing Lake Como. Email correspondence between the friends begins as touristy descriptions but soon zeroes in on intrigue: someone finds nurse Tina Xin’s body floating in the lake. Ann and Fang Chen both suspect foul play, which authorities later confirm, but he can’t do much investigating in a foreign country. However, by sheer fortuity, Ann’s apartment neighbor in Boston, Lao Xin, is Tina’s brother. A postcard from Tina suggests that she’d found the female Red Guard who killed their mother during the Cultural Revolution, but before Xin can provide Ann with specifics, he’s dead from an overdose. Ann’s convinced that the murderer is covering her tracks, starting with Tina’s possible blackmail in Italy. But she needs to find the elusive Red Guard first. Using Xin’s address book, Ann contacts names from the U.S., while Fang Chen, in China for his and Jane’s wedding party (courtesy of her mother), takes a solo excursion to Shanghai. If Ann can’t gather rock-solid evidence, though, she’ll have to extract a confession from a killer. The author (The Fatal Sin of Love, 2015, etc.) excels at understated mysteries, exemplified by series protagonist Ann, a nondrinker who prefers quiet get-togethers but happens to be an exceptional sleuth. The novelist takes a rather charming approach this time, detailing Ann’s ongoing emails with Jane and messages to Fang Chen. The former consist primarily of Ann describing Italian scenery or her meeting with boyfriend Alan Rourke’s parents, while the latter tend to focus on juicy morsels of the murder case, including someone’s shady past. Notwithstanding, it’s an omniscient narrative that further deepens the mystery: nosy neighbor Ms. Brown may become a witness, and series regular DS Paul Winderman assists with much-needed background checks. Ann could be putting herself in danger near the end, beefing up suspense. And despite a later plot turn that relies a little too heavily on coincidence, the resolution satisfies both logically and dramatically. These resolute protagonists and self-proclaimed mystery buffs should certainly appeal to genre fans.